A book with a title of 'What Alice Knew' is just begging to be read and I for one was desperate to find out exactly what it was that Alice knew. On finishing the book, I'm not really sure if we ever found out the depth of what Alice knew. For me, I felt as if I had more questions than answers at the end (and that's not always a bad thing) but on the whole I did enjoy the book and I think that it is an excellent debut by T.A. Cotterell. Alice is a talented and much in demand portrait painter. She has a wonderful, reliable husband until he goes missing one night. As Alice retraces Ed's movements following a party that he went to, she realises that Ed has made some uncharacteristic decisions. Not only does Ed not usually drink alcohol but he seems to have gone back to a strange woman's place. When this same woman ends up dead, I wondered if Alice really knew her husband at all. Alice is an unusual but very complex character; she has events in her past that she is ashamed of and as an artist she sees beyond the mask that many people wear to the real person underneath. Which is why I think she was so calm when her husband first went missing. Many people would be combing the streets and ringing hospitals but not Alice, she walks into the village for a cuppa when Ed finally calls her. When Ed gradually opens up about what happened, again Alice seems quite in control. Perhaps nothing can shock her as she can see Ed for who he really is. Who is he? An adulterer and a murderer? 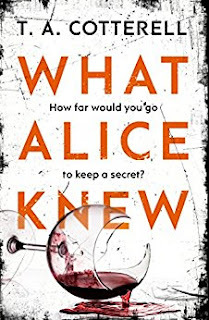 What Alice Knew is an extraordinary page turner as you find out what Alice knew quite early on but the pages keep on turning as she attempts to deal with the repercussions. It's a marriage under the magnifying glass as Alice paints over the cracks but the cracks keep appearing and Alice is running out of paint. My brain was tied in knots as there were so many versions of Ed's story that I wasn't sure which one to believe. What I am pretty sure of is that Alice knew a lot more than she's letting on. This really is a great debut and I'm sure that we will be hearing a lot more about T.A. Cotterell. I wasn't surprised to learn that T.A. Cotterell read History of Art at Cambridge as his love of art shines out from every page. I will certainly be keeping an eye out for his next book.